Frequent visitors to my blog will have noticed I recently published the book Longshore Soldiers about my grandfather's WWII Army port battalion. They took part in the D-Day invasion and moved supplies over Utah Beach from June to November 1944. 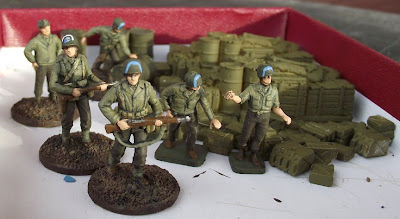 I am putting together 1/72 models to arrange a scene from their work. I built and painted an Italeri DUKW model and working GIs. Right now I am finishing a mess of oil drums, jerry cans, and supplies. Once they're ready I'll make a diorama of supply operations. Photos and a full write up are forthcoming. If you are interested in the port company's work in the European theater, then click over to my book blog. I have photos and articles to support the book. Wow, very well done figures. I really like how the uniforms and helmets came out!! I am looking forward to see your project finished! May I ask where did you get the oild drums, and wooden boxes from?? Thanks. The oil drums, jerry cans, and the block of supplies come from Sgt's Mess. I found someone selling them on eBay.